24-Man World Raids is a difficult daily quest in Blade & Soul. But you can get rich rewards like Soul Shield Chests, 8-10 Blade and Soul gold, and 5-10 Naryu Silver. This quest can support up to a total of 24 players in the map to do it, and these players can never interact with each other except when killing the boss. To start, use the Party Search totems after teleporting to the Wayfarer’s Wharf windstride point in the Blackram Shipyard. It takes 1 Naryu Silver to buy Nightshade Harbor. But the E.Fleet is free. Go outside and you can see a Wheel of Fortune. 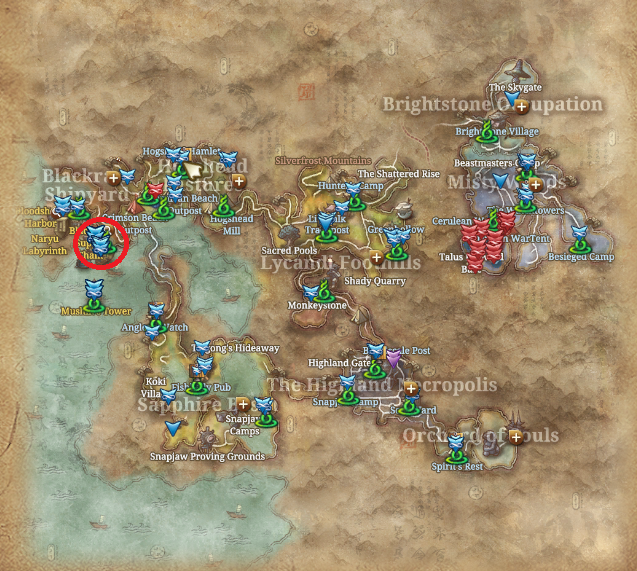 There are NPCs next to them who allow you to trade Naryu Coins or Moonwater Valor Stones for tickets. It is suggested you not trade stones. You should keep a few Naryu Coins in your hand to use for the next Dragonblood in case. And you can use the rest to gamble on this wheel. If you die when fighting with the boss, you should never release as you have to kill them again though you will lose your loot from the boss. Ask for a rez, I think most players are willing to help to provide one. There are 6 total quests: Broadside the Blackram, Capsize the Captains, The Chain of Command, Brethren of the Coast, Allies of the Blackram Marauders and The Chain of Command. Every single quest is simply a “kill X number of NPCs” or “kill X boss”, so this is much faster with a group since kill credit is shared. It is not necessary to know how to perfectly kill the boss as they are so many players killing them. Just don’t stand in the fire. After 9 bosses get killed, Poharan spawns. You will need damage Poharan for at least 1% of her health to get credit for the kill. Usually, you need spend about 30 minutes with a group to kill her. Or it may take longer if you wait for her Spawning. There are 7 total quests: Dead Reckoning, Bashing Buccaneers, Where the Dark is Deepest, A Shady Alliance, Officers of the Blackram Marauders, Poaching the Poachers and The Man Behind the Mystery. The same as the E.Fleet, there are too many players so that they become easily to be completed. Mysterious Man spawns after 9 boss kills, just like Poharan. It takes about 30 minutes with a group. May take longer if you wait for Mysterious Man’s spawning.